You are currently browsing the tag archive for the ‘Arthurian cycle’ tag. 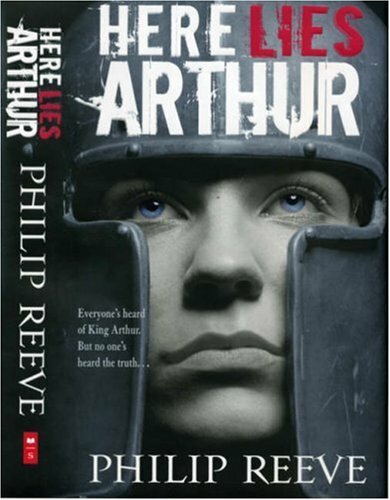 Philip Reeve rather kindly includes a series of notes at the back of this novel, with an explanation of what inspired this further addition to the Arthurian cycle, already chock-full of revisionist takes on this most famous of British myths. Reeve states that he has been fascinated with King Arthur since he saw John Boorman’s Excalibur in 1981.You cannot guess my relief that he did not say that insipid 2004 King Arthur flick. Philip Reeve was already one of my favourite literary people (the other is Philip Pullman – I call them the two Philips) thanks to his excellent Mortal Engines series, but this revelation has clinched it for me. Philip Reeve is a wonderful human being. There I’ve said it. Gwyna is a young girl, one night forced to run for her life after a raiding party attacks her home. The men belong to a marauding brigand known as Arthur, who crushes farmers and landowners who refuse to pay him protection racket. Pretending to Christian devotion, with the symbol of the cross adorning their armour, while the men still worship their British gods. They are little more than savages, pretending to long-departed Roman civilization. Gwyna is rescued by bard and storyteller Myrddin. He’s not much of a musician, but he has a canny way of knowing just what lies to invent for an audience eager to hear tales of the mighty Arthur, the man who is destined to unite Britain and cast out the Saxons. Myrddin is inspired to invent a new tale to confirm Arthur’s mythical standing and arranges for the warrior to travel to a traditional religious site, where he is met by the ancient goddess the Lady of the Lake. What neither Arthur, nor the men watching open-mouthed on the shore realize, is the mystical figure who presents their leader with the sword Caliburn is actually Gwyna. The event binds the men to Arthur and Myrddin is pleased with his efforts as kingmaker. In gratitude to the terrified girl, he disguises her as a boy, gives her the name Gwyn and teaches her in the ways of creating living myths and heroes. Gwyna’s crossdressing adventures allow her to be present at the many demystified events that Reeve has extrapolated from Arthurian myth. Myrddin is of course a far less magical Merlin, a trickster spin-doctor, an ur-Alastair Campbell (or Malcolm Tucker!). There’s also Medrawt (here Mordred), Bedwyr (Bedivere) and of course Gwenhwyfar (Guinevere). There are even hints that Gwyna herself is a version of Morgan le Fay and at one point having spent too much time around Myrddin conjured up the grail myth. While I would much prefer to read another Mortal Engines book – Reeve’s own fictional universes have a vivacity and creative genius all of their own – this is still a witty retelling of the Arthur story. The mythical king of Britain is here revealed to be a gangster, obsessed with acquiring more territory, with his ‘Merlin’, waging an aggressive P.R. campaign to unite the British tribes beneath the man he is convinced will defeat the Saxons. Myths and lies become indistinguishable, as Gwynna becomes more expert in their gullibility of most humans. Another fantastic yarn from the imagination of Philip Reeve. If LA isn’t the first true American city, she is certainly the greatest. I think so many journalists and tourists report condescendingly on her because they don’t being to understand the depth of the culture-shock they have experienced. A shock nothing like as immediate as the one you receive from New York, but one which is in my view far more lasting and harder to cope with. I bought this book from a second hand store shortly after J.G. Ballard died. I had just read Michael Moorcock’s tender obituary and was thrilled to discover more about their friendship. The girl in the shop remarked that she had been surprised so many folk were buying up Ballard books before she heard the news. It was a curious friendship between the two men, both writers who appeal to quite different perspectives on the world. Ballard’s writing evokes a fascination with a coldly objective world, where humanity itself is a passing phase and the remnants left behind, abandoned cities and nuclear fallout, have just as much a claim to life. There is a fascination with an ordered vision of a world stripped of human failings and mortality. Moorcock by contrast takes a perverse pleasure in the grit and grime of fantasy realms, where stories are all lies and wonder is to be found in the rotten core of human history. What I find odd about the correspondence collected in this volume is that the style is indistinguishable from the crooked authorial voice of his fiction. Indeed I began to question just how real these sights and encounters with the strange denizens of Hollywood were, as the adventures of Moorcock the Englishman abroad seemed too similar to those of his character Colonel Pyat in Jerusalem Commands. If this is fiction disguised as travel writing, it is a fine joke. We are not privy to Ballard’s replies in this correspondence and Moorcock makes reference to painful personal events during the course of his stay in the States. His marriage had just broken down and emotionally crippled, he travelled to L.A. to visit a writer friend from his New Worlds days, Graham Hall, who was himself dying. Moorcock gives an unsentimental account of his friend’s selfishness and hurtful decision to drink himself to death. He is also deeply affected by what he sees as the waste of a potentially great writer’s talent. While Moorcock’s name is frequently associated with psychedelic drugs, he eschews puritan hypocrisy in his lamenting of a friend’s life destroyed by drink. He contrasts the aspirational character of Californians, living in a beautiful landscape of sun and surf, with the fatalistic affectations of English Bolshieness, would-be working class heroes with a college degree and ideology in a bottle. Moorcock’s attempts to raise funds to rescue his soaring overdraft – courtesy of his estranged family relations back in England – land him a position as a script-writer on a revisionist King Arthur film. He identifies the director of the picture only as ‘Ike’, an old Hollywood player who has just had a great success with the space opera genre. I assumed this was a coded reference to Irvin Kershner and a quick google would appear to confirm this. At any rate ‘Ike’ is something of a cartoonish figure, a monstrous ego on legs who insists on Moorcock introducing a black character into the Arthurian cycle on one day and homages to Kurosawa on the next. The well-worn dictatorial relationship between the director and the screen-writer is ploughed through, with Moorcock emerging shaken and disturbed. Once again I begin to wonder just how real ‘Ike’, is. He seems more a collection of Hollywood player clichés, which does not mean he does not exist. Just Moorcock’s flights of invective remind me more of a fictional dilemma than an actual account. An earlier encounter with a sf fan tattoo artist also raised suspicions. The character in question is identified by the name Gulliver and bonds with Moorcock over Alfred Bester’s The Stars My Destination. The main character of which is memorably described as having a number of facial tattoos, and named Gulliver Foyle. Perhaps it is a coincidence, but it made me curious nonetheless. For Hollywood itself is a place filled with unreality, where the ‘English countryside’, of a Robin Hood serial is just over the hill. 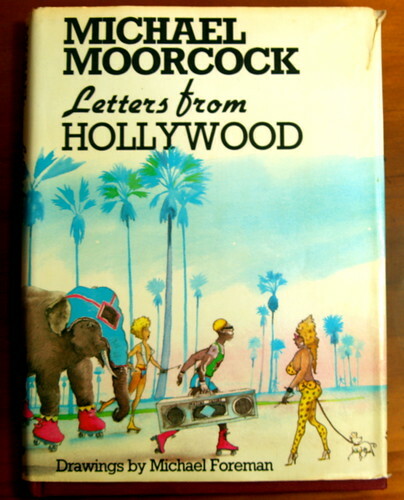 Trust Moorcock to prove to be such a winning guide to the darker half of sunny L.A. Evocative and very intimately written.